Life insurance companies continue to show a strong appetite for commercial mortgages as a piece of their investment allocation. In 2017, life insurance companies originated over $61 billion of commercial mortgage debt, and feedback from our correspondent life insurance company lenders indicates that this appetite will continue through 2018. However, there is a trend toward more conservative, lower-risk loans as we move into the latter stages of the current economic cycle. For life insurance companies, that means two things: first, a focus on low-leverage transactions (sub-65 percent loan to value); and second, an increase in their asset allocations toward multifamily properties. Of course, finding and winning those deals is easier said than done. Every lender would love to overweight their portfolio with low-leverage, multifamily loans! So how are life companies winning these “unicorn” loans? Let’s start by looking at the competitive landscape. Life companies’ two biggest competitors for this product are the agencies and banks. 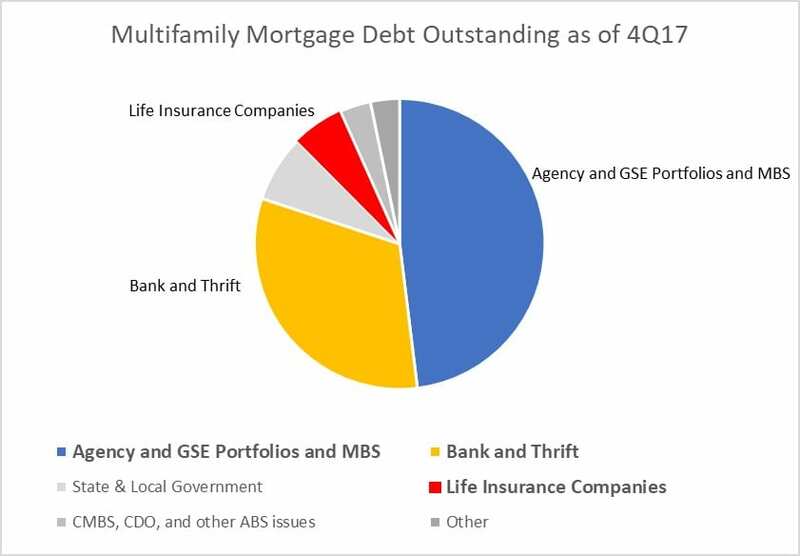 As of the fourth quarter, agency and government-sponsored enterprise portfolios and mortgage-backed security comprise 48.1 percent of the total multifamily mortgage debt currently outstanding, banks hold 32 percent, while life insurance companies only make up 5.8 percent of the outstanding debt, per MBA Commercial/Multifamily Quarterly Databook Q4 2017. Life companies are chipping away at the market share of the agencies and banks in three ways. The first is through creative financing on newly constructed assets. While Fannie and Freddie are beginning to offer “near-stabilization” loan programs for their existing borrowers, life insurance companies can get much more creative on a deal-by-deal basis, as opposed to fitting every loan into a one-size-fits-all execution. Two recent examples of creative transactions that the team placed through our correspondent life company lenders demonstrate the variety and complexity of structures that can be created. 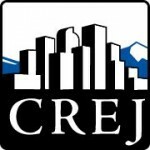 For one newly constructed Denver apartment community, we were able to structure a forward-rate lock when the property was only 20 percent leased, such that the loan would fund when the building reached stabilized occupancy. In this scenario, our borrower locked in a long-term coupon when the 10-year Treasury was 2.35 percent, before it jumped 50 basis points just two months later. On another property, we locked rate prior to construction completion, which was possible because the property had very strong leasing velocity. We closed the loan after the property satisfied a minimum occupancy test and structured a minimal amount of recourse until the property reached stabilization. In this case, the entire closing process took 60 days. 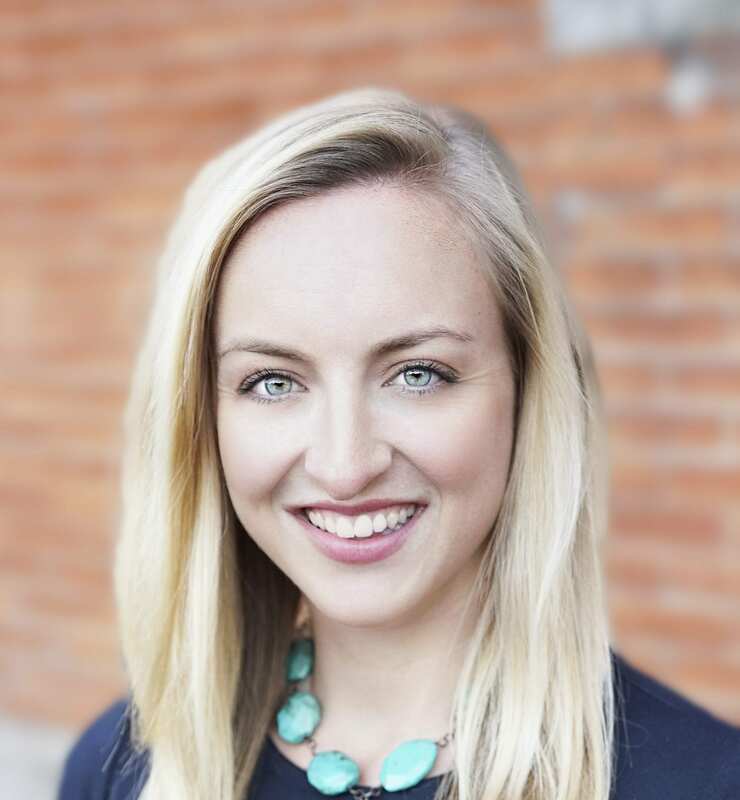 The beauty of a life company execution is that it has the ability to understand each property’s story and create a loan solution that helps the borrower achieve his ultimate financing goal, rather than offering a set “program” like the agencies. The second way life companies are gaining more multifamily market share is that they are beating the agencies on pricing when it comes to low-leverage, stabilized multifamily loans. Because of the intense demand for super-core, AAA-rated loans, life companies are more aggressive than ever before for sub-65 percent leverage multifamily product. Last year, we originated two 65 percent loan-to-value multifamily loans with two of our exclusive correspondent life companies, both of which were able to offer better pricing than the agencies. While Fannie and Freddie can still out-compete life companies on proceeds at 75 percent or more LTV, for the right deal, life companies are simply more competitive on lower-leverage debt. Further, when you get down to 55 percent LTV core multifamily loans, we are seeing life company spreads in the 110 basis points range and below. Third, a significant market shift is creating an opportunity for life companies to steal business away from banks. In recent weeks, many headlines have talked about the flattening of the yield curve. In fact, the spread today between the three-month Libor and the 10-year U.S. Treasury yield is the lowest it has been in over a decade (only 111 basis points, down from 358 basis points in 2010). While short-term treasuries are ramping up quickly as a result of the Treasury’s desire to keep the economy from overheating and their need to fund expanding budget deficits, long-term yields have remained somewhat stable, with only moderate increases. What does that mean for borrowers and lenders? At the most fundamental level, the incremental cost of capital for long-term, fixed-rate loans is the lowest it’s ever been. While banks historically have been able to offer incredibly low rates for short-term and floating-rate loans, the gap between those coupons and fixed-rate life company coupons has essentially been eaten away. For borrowers weighing their options between a short-term bank loan and a long-term fixed-rate life company loan, they are starting to see the same ultimate coupon, if not lower, for a long-term loan. If borrowers have any inclination to hold onto their asset for five or more years, it likely makes more sense to fix a longer-term life company loan at almost the same coupon they can get today on a short-term loan from a bank. Not to mention the fact that life companies offer nonrecourse loans. Due to the ever-flattening yield curve, which is erasing the competitive advantage banks have been able to offer on short-term rates.